In 1998 the United States Green Building Council established the Leadership in Energy & Environmental Design (LEED) program as a third-party certification system for judging the energy efficiency of buildings and communities. Since its inception, the LEED rating system has become the mainstream standard by which architects and developers judge the energy efficiency of a commercial or industrial building. Businesses earn credits for various steps they take toward improving efficiency, and they become LEED-certified after attaining a certain number of credits. LEED certification has come to be a prestigious accomplishment for a company and a goal that many seek to meet. Here we’ll look at two ways architects and building planners are designing buildings to meet LEED standards: perforated metal sunshades and exterior cladding. Perforated metal is available in many different variations of patterns, sizes, and materials, and is used for an even greater variety of applications, such as signage, drains, lighting panels, and more. For architects looking to attain LEED certification for a new or existing building, perforated metal sunshades and exterior cladding are of the most interest. Perforated metal sunshades are an effective way to control how much sunlight enters a building and are helpful for reducing both heating and air conditioning costs. Perforated sunshades can be used on the exterior of a building to find just the right balance of natural sunlight for a workplace. Skilled perforated metal fabricators are even able to identify the best position for the placement of sunshades, based on the angle of the sun throughout the day and the intensity of the heat in different seasons. They can also customize the width and design pattern of the perforations to suit architects design requirements. Perforated metal cladding is another great way to earn LEED credits. 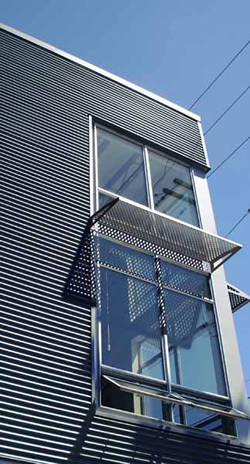 Cladding panels can be outfitted to the exterior of a building to further control how much sunlight hits the building. Cladding just means covering a surface with perforated metal panels and is used for a variety of functional and aesthetic purposes. In addition to earning companies LEED credits, cladding lowers heating and air conditioning costs by helping to insulate the building. There are about half a dozen different categories for which a building can be LEED-certified, including standards for building construction, interior design, and building operations. Different steps are required in each category to achieve credits, but all categories judge buildings on a 100-point scale. So, whether you’re looking to begin to work toward meeting LEED standards or you’re just shy of being certified, perforated metal sunshades and cladding can move your building in the right direction.